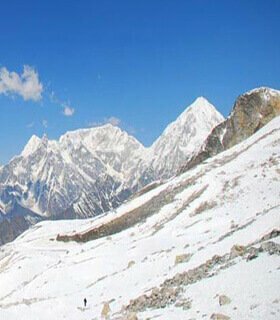 Manaslu trekking is located under the restricted area trek in Nepal. Mount manaslu 8,163 meter is the eighth highest mountain in the world and reward with a stunning panorama and finest aspects of spectacular massifs. Mt. Manaslu region trekking is located under the restricted area of off the beaten path trekking trail Nepal. Apart from Manaslu, we will also get chance to explore the stunning panorama of other mountains including, Annapurna, Himlung Himal (7,125m), Annapurna massif, and Ganesh Himal Peaks. Visiting mount manaslu is standing isolated and yet in the very center of Nepalese Himalayas which part completely belongs to Nepal. Manaslu Trekking tour includes strong influences from Tibet mixing with typical and diverse Nepalese culture and ethnicity. Well, the contrasting ascent and descent gradients and the spacing of higher elevation lodges represent the area as the best trekking destination of Nepal Himalayas. However use us to design your ultimate experience, and get hand-crafted trek tour trips built by local experts guides. How to get Manaslu Trekking permits in Nepal? and how much is the permit cost. Manaslu controlled region / restricted area permit: US$ 70 per week + US$10 per day extra for each trekker. The first check is at Jagat and last check Dharapani. You’ll probably need more than 7 days to get from place to place. Likewise, you need also Manaslu conservation area project (MCAP) permit: 2,000 (approx 20 Euro or US$20) + 13 % as a VAT and also Annapurna conservation area project (ACAP) permit: 2,000 (approx 20 Euro or US$20) + 13 % as a VAT. To explore Manaslu region trekking you should go through the registered company like Gokyo Treks and Expedition Pvt Ltd. We at Gokyo Treks and Expedition Pvt Ltd are happy to arrange your all kinds of permits and other travel arrangements so let us know your details. To obtain the permits, we need at least 20% advance deposits with a copy of passport and copy of visa and as well as passport size photographs. Remember, if you are going to Manaslu for any trekking tours than hiring at least one guide (support team member) is compulsory as it is rules of the government in terms of your safety..
Colder time but generally clear skies. But very beautiful time to discover this region trekking. Fewer trekkers along the trek routes, nice views of Himalaya, winter season, cold at night, fresh and beautiful. Travel in Monsoon months is not good enough for hiking. There are a lot of grassy landscapes and there might be leeches in a lower elevation. So, it is not a good idea to trek in Moon soon time. But if you are visiting the city, world heritage sites than its also a great time. There are many reasons to choose Manaslu trek but top 8 reasons are given here for your reference. On your journey to discover Manaslu trek route, you can enjoy the top mountain view of Manaslu (8,156m/26,753 ft) family. Furthermore, you can get the best view of Mt. Buddha, Mt. Shringi, Mt. Churen, Mt. Ganesh, Mt. Himlung, Annapurna. Reaching crazy Manaslu means the top destination listed under 05 famous trek route in Nepal. Manaslu is less popular comparing other routes because of publicity. There are fewer visitors every year. If you are the special guest and want to hike in less touristic areas than it is the best. Best time to hike there is either on October-November or March-May. There is very less number of visitors every year. So, the teahouses are offering the basic needs and requirements for tourist. You might not have several varieties of dishes because of fuel. Due to the complex geographical structure, it is difficult to transport foods and vegetables in these high altitude areas. Comparing to other trek routes, foods are less expensive. Hike to crazy Samdo hill is easier rather than samdo peak climbing. You can also hike to the Tibetan border. 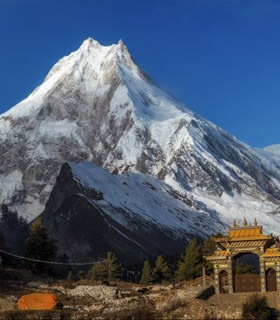 Both of these hill station hiking offers the outstanding view of the Manaslu massive including Manaslu central, Manaslu north, Samdo peak, Shringi Mountain…etc. Furthermore, you can walk a day tour to Manaslu glacier, basecamp, glacial Birendra lake, and beautiful rivers. Hike to Manaslu route in spring is better than the autumn season. Trek into the spring, Rhododendron forest turns the colorful forest. So, April to late May is the best time to visit. Red rhododendron is the national flower of Nepal. Enjoy the view of red rhododendron in contrast to snow-covered mountains in the background. There are the chances to explore villages out of the main trek route. Pungeen Gomba, Birendra Lake, etc. are some of the other trips you might love to make. Between Shyala and Samagaon, you can side trip to Pungeen Gompa. In clear weather, you can enjoy with the great view of Manaslu. Besides that, you can walk passing several Mani Walls, Prayer Wheels, monasteries, Chortens, etc. Locals are influenced by Tibetan culture to a great extent. As you visit the Tsum Valley, you might see the pure and original culture. The valley has its own culture, language, still maintaining the practices of ancient Buddhism. You can trek to the spiritual touch.